Weather has a significant impact on wildfires – in how they start, how aggressively they spread, and how long they burn. Find out the current fire danger rating in your area and other information about fire weather. The BC Wildfire Service operates about 260 weather stations, which send reports on an hourly basis. These hourly weather observations, supplemented by data from other agency stations, support fire weather forecasting and the Canadian Forest Fire Danger Rating System (CFFDRS). The computer-based CFFDRS is the primary fire management decision aid in Canada. With it, fire managers can assess the potential for ignition, spread and burning intensity. This information is used for making fire prevention, preparedness and suppression decisions, as well as other general fire management decisions. Temperature, relative humidity, precipitation, wind speed and wind direction are recorded by the fully automated stations. 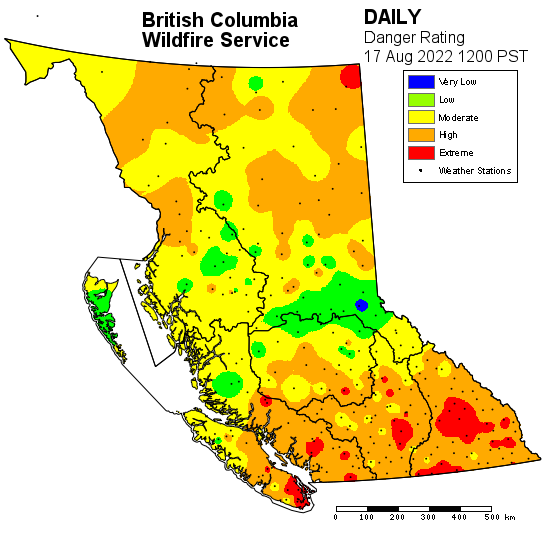 This data is transmitted to BC Wildfire Service headquarters every hour from April through October, but less frequently and from fewer stations during the winter months. Data from other agencies’ weather stations is also used and transferred electronically to headquarters. The fire danger rating (i.e. the risk of a wildfire starting) for the province is updated daily at approximately 2 pm. NOTE: The danger class map is intended for general public information only. For regulated forest operations, the danger class value must be derived from weather data representative of the site on which operations are being conducted. Where discrepancies exist between the colour display on the weather maps and the numerical values posted for the weather stations, the posted numerical values shall take precedence for the purpose of implementing the Wildfire Regulation. A detailed danger class report provides estimated and forecast fire danger rating values for specific weather stations. The danger class report is updated every day based on weather station data collected from around the province. To find out what the fire danger rating is near you, please select a region from the list below or view all regions. Please note that the data within the danger class report is only relevant for the geographic location of the weather station. Persons carrying out industrial activities who want to apply the danger class information from this website must determine that the weather station location is representative of their operational area. Check weather conditions in B.C.